Nancy Klepac, LPN, Certified Dementia Practitioner, Executive Director at Willowood at Mustang is making the senior residence outstanding in the Mustang Community. Walking into Willowood you’re bound to see someone sitting at the piano playing a tune or relaxing on one of the couches in the grand entryway reading a book. There’s a feeling of home inside Willowood that Executive Director Nancy Klepac, LPN, Certified Dementia Practitioner, and her staff work hard to foster. Care and comfort combine at Willowood, which will undergo a facelift this year thanks to a new owner. Klepac is excited about the plans guided by Heart Living Centers for the community that has enjoyed a long history in the wonderful and quaint city of Mustang. Situated along State Highway 152 Willowood’s stately columns hint at what waits inside. Details have been carefully thought out to meet resident needs. Klepac has spent a quarter century caring for seniors and their details. 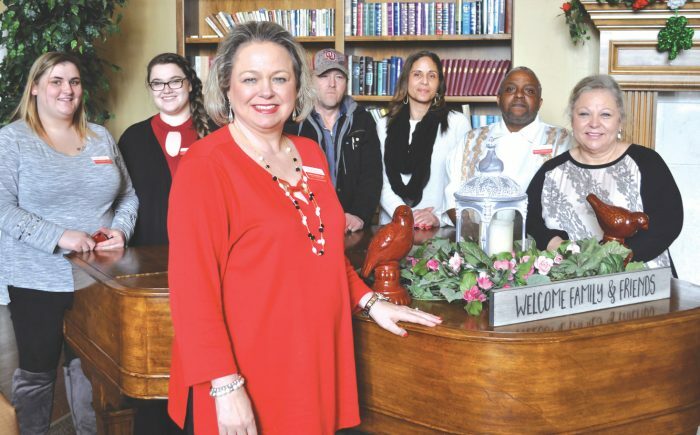 “We offer a variety of services and we have a very high bar of care that is exemplary for our residents that are living here,” said Klepac, whose innate calling has always been caring for elderly people. Heart Living Centers represents new beginnings for Willowood with renovations and many updates to come. Meeting with new ownership was a satisfying feeling for Klepac. Klepac’s experience with senior living runs the gamut from nursing to leadership. She was eventually drawn to Willowood, starting as the director of wellness. That’s near and dear to Klepac’s nurse heart. You’ll see her in scrubs on some days helping out where she is needed. “Scrubs wash easily,” Klepac laughs, recounting the times she’s pitched in to help wherever a resident might need her. It’s also why she’s looking to help Willowood expand its reach to potential residents with chronic illnesses that are often underserved by traditional senior living communities. In the coming months Klepac said you’ll see Willowood offer services for chronic disease management not typically seen. And she won’t do it alone. Her staff is her extension throughout the building. That means availability for Willowood residents. Whether it’s something that doesn’t work in the middle of the night or the middle of the day, residents have the ability to reach out. And even if they don’t need anything, Klepac and her staff are their to love on them.